I really hemmed and hawed about what quilts to enter into the Bloggers Quilt Festival hosted by Amy @Amy’s Creative Side this fall. I have several quilts that I am really proud and excited to have made in the past 6 months, and narrowing down 2 to enter was tough. Ultimately, I chose to enter the Connection Block Mini quilt into the Small Quilts Category so that I could share more about the details on the mini quilt. Previously I just linked to the Sew Mama Sew tutorial for instructions on how to piece the block, but I enjoyed making this mini quilt and I LOVED quilting it so much that I am excited to be able to share more details with you about it today. The pieced block finished at 24.5-inches square, and after quilting and binding, the mini quilt finished at 23.25-inches square (~5% shrinkage), which makes the perimeter 93-inches. I used Kona solids for the mini quilt (Kona Blue Jay for the background, Kona Nautical for the top half circle, Kona Marine for the right half circle, Kona Sky for the bottom half circle, Kona Riviera for the left half circle, and Kona Surf for the binding), and I color matched with my 50wt Aurifil stash for the quilting. I used a combination of walking foot / straight line quilting and free motion quilting. I started by creating the strong diagonal lines that pass through the center of the quilt in a small crosshatch. I then echoed each half circle with my walking foot. To fill in the negative space, I found the central point between the echo of the half circle and the inner crosshatch line for each quadrant and I then echoed that shape once in each direction. In the remaining space, I free motion quilted chains of circles that expand and contract to fill the gap. 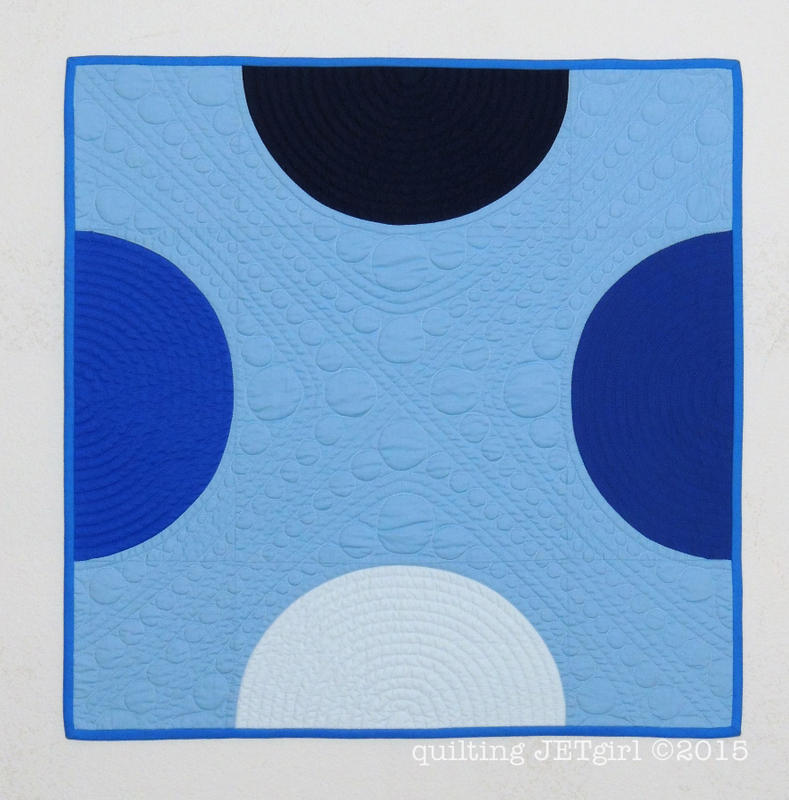 I love the way the size of the circles emphasized the size change of the shape of the negative space and draws my eye around the quilt. I have found that smaller quilts can be a great canvas for trying new techniques, like gaining confidence in curved piecing and exploring new quilting designs. I love the way this mini came together, and I thank you for taking a closer look at my Connection Block Mini Quilt! that’s pretty cool, love the quilting designs! Wonderful tutorial, but really scary, but long weekend here as its labour day on Monday in NZ so will practice, thank you so much!!!!! Thanks for sharing the closeup of the quilting . It’s really well thought out with the different sized circles and the straight lines and curved lines. You are a very skilled quilter. Yvonne, this is the first time I have had the pleasure of seeing this mini quilt. WOW!!! This is such a spectacular piece of art! 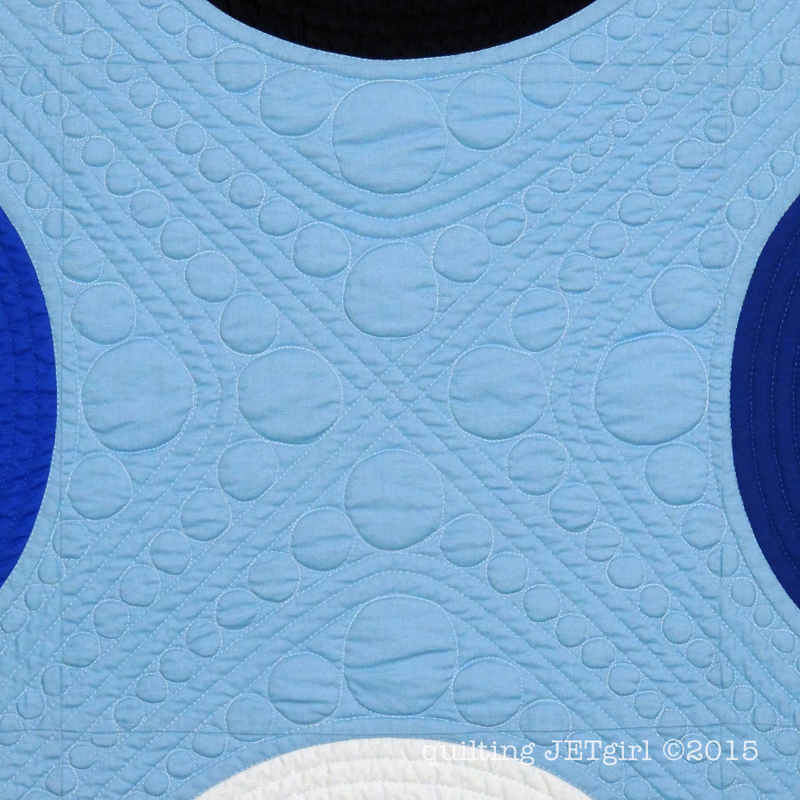 I love the way you have quilted each circle that creates (for me) such a soft but defined movement. I just wish I could truly see this piece up close. Thank you for sharing this beauty and information with us. Once again, you have really inspired me to explore the world of quilting even further. Have a spectacular wonderful creative day! I think I may have missed this first time around. I really do like it , will get my vote ! I adore the quilting on this – it’s fabulous! Great job. Absolutely love the quilting, great job! The quilting in this project is what makes it shine. Good luck! 2. Playing with our cats, Biscuit and Emma. 3. Talking on the phone or visiting with friends and just catching up with day to day stuff over coffee or tea. 4. Reading a magazine, newspaper or book. The first two are the better choices in this case because they are shorter. 5. Going for a drive. 6. Watching a favorite movie. I Love the quilting on this piece!!! And I love how it looks on your wall!! This is one of my favorite quilts you made! I am so glad you chose to enter this one and post about it so I could see again. I love seeing this one again! It’s gorgeous!! I love the free motion quilting you chose for this quilt. It adds another layer of dimension and movement to the quilt. 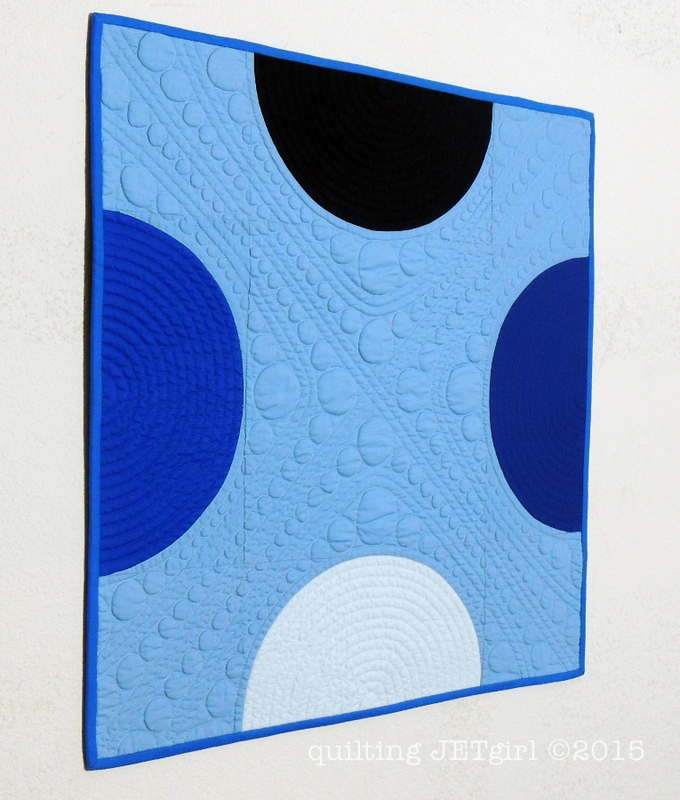 All the circular movement combined with the great blues gives this quilt and over all calming affect. I love the quilting on this one too! The circle and straight lines are so harmonious! 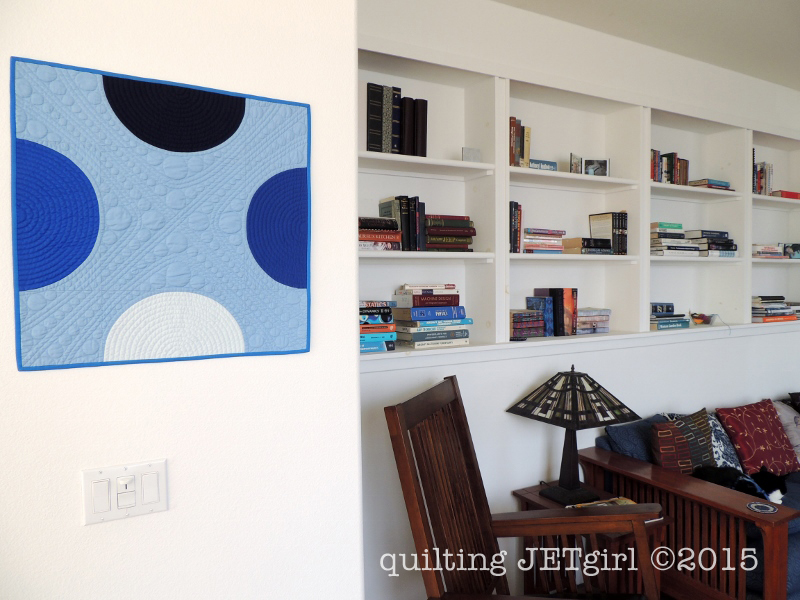 Your pictures show off the quilting so well, and I loved hearing more about the process. Dividing the negative space like that turned out great! Thanks for explaining your process. At first glance the quilting looks complicated, but it’s really quite simple – and simple works beautifully! Not being particularly active in blogland this last month or so the quilt festival has completely passed me by, and I expect I’m too late to do any voting now :(. But it was good to look at this a bit more closely, I don’t remember noticing the quilting before and it’s so effective.